In one of his most significant speeches after taking over the reins of the state, Chief Minister, Mufti Mohammad Sayeed, Wednesday justified his alliance with BJP, describing it as a great opportunity that has come his way to change the destiny of the people of the state.He vowed to lay a strong base for building a new J&K, where peace and prosperity go hand-in-hand. “I have no personal agenda and don't enter into any deals. History has given me an opportunity to change the course of the state and I have taken up this challenge with both hands,” he stated.The Chief Minister was addressing a huge public gathering after laying foundation of a new Mega Fruit Mandi at Aglar, Shopian today.He was flanked by the Minister for Horticulture, Haj & Auqaf, A. R. Veeri, Minister for Revenue, Javaid Mustafa Mir and Minister for Transport, A. G. Kohli. Speaking at length over forging alliance with BJP after two months of hectic deliberations, Mufti Sayeed said Prime Minister, Narendra Modi, enjoys support of 1.2 billion people of the country. He said his prime objective is to give people a truly representative government that wins their hearts and minds in all the three regions as this is the only way by which we can keep the state’s multicultural ethos alive. “I am not a scheming person and don't enter into any political deals for personal gains. My career is like an open book which everybody can read. I have seen power right through my life. My only goal is to remove the clouds of uncertainty and link the regions of the state together,” he said, while addressing the large gathering of the people here.Reflecting upon India’s relations with Pakistan, the Chief Minister said New Delhi has time and again extended a hand of friendship to Islamabad. He referred to the initiatives taken by former Prime Minister, Atal Behari Vajpayee, which led to a prolonged thaw between the two neighbours. “Na Bandook Se Na Goli Se, Baat Banegi Se Boli Se. I have said it before and I repeat that political uncertainty will only end by a meaningful and sustained dialogue between the two countries,” he stated.Mufti Sayeed observed that people have waited patiently since 1947 for a political process that promises them a better and prosperous tomorrow. “We have gone through tough times. The people need succour which my government vows to provide,” he promised.Defending his oft-repeated slogan of battle of ideas, the Chief Minister said he hates to thrust his ideology upon anyone else and doesn’t believe in muzzling the voices of the people. “I don't have monopoly over political ideologies. I don't like putting people behind bars, but I believe our ideologies should serve people better,” he observed. Asking people to become partners in state’s progress and development, the Chief Minister highlighted various measures taken by the government in its short tenure to remove the scourge of corruption so that people get a fair, transparent and responsive administration. “We won't allow anyone to swindle public money,” he assured.Referring to the several developmental initiatives taken by the government, the Chief Minister pointed towards creating a network of good quality roads where contractors have been held accountable by incorporating a ‘Defect Liability Clause’ whereby they have to maintain roads over a period of three years.Handing out an assurance to the people on merit being the only criterion for selection in jobs, the Chief Minister outlined his grand plan to transform the education sector so that it matches global benchmarks. 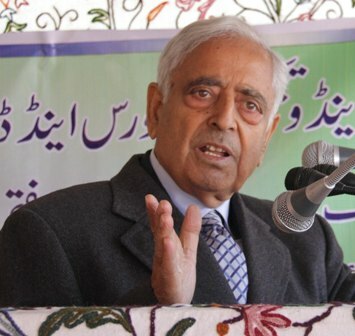 “We will link education with employment by offering market-driven courses to our talented youth in universities to enhance their employability,” he stated.Referring to the newly-sanctioned medical colleges and AIIMS in the state, Mufti Sayeed said the government plans to set up nursing and paramedic colleges to augment the manpower for these upcoming institutions. “There is great demand for paramedic staff, especially nurses, some of whom have been trained by Bibi Haleema College, who have found employment overseas,” he added.